While I was at the Pitt Meadows Airport open house last month, I stopped to chat with some of the pilots and aviation enthusiasts there and heard from more than a few of them about the Airport Coffee Shop at the Chilliwack General Airport. The cafe there, I was told, served the world’s best pies. I was intrigued. The claims sounded too good to be true, and I was skeptical of the fact that there might be anything out in Chilliwack anywhere that is worth eating, let alone at an airport. But, being in the neighbourhood, I decided to check it out. 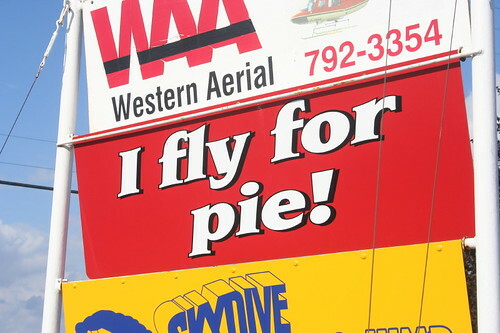 As the slogan of the cafe implies, many local pilots fly to the place just for the pie. 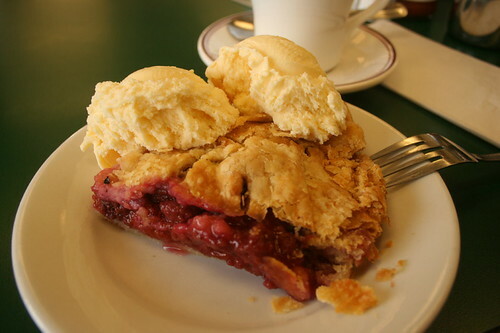 As we arrived, a man parked his biplane right in front of the cafe windows and entered, announcing that he had flown a hundred miles for a piece of rhubarb pie. Unfortunately for him, the cafe just happened to be out of that flavour. I agonized over the rather largeish selection of flavours and eventually decided upon raspberry peach. And while I don’t have the authority to say whether or not it is the best pie in the world, I can definitely say that it was the best piece of pie I’ve ever tasted. The pastry was crispy and flaky all the way through, without being greasy or soggy, and the filling was pleasantly sweet. It puts my own creations to shame. Thinking back on all the times when I had driven out with my family to see my grandmother only to be caught up in the rather poor selection of dinner options, I really wish I had known about the airport. oooh anyone up for a trip out to Chilliwak?